‘Wee One’ lavender is a little gem of a plant. This dwarf English lavender is appealing in so many ways. First, it is a true lavender, a bastion among perennials and a must-have for gardeners. Then, there is the fragrance, from the flower and the aromatic foliage that perfumes the garden with a crisp, clean floral scent that calms and relaxes when inhaled. The flowers are delightful with compact heads of lavender-blue flowers and dark blue calyxes and can be cut for petite bouquets or for scented sachets. In the garden, this slow growing shrublet is best planted in sunny sites at the edge of borders or tucked in a rock garden. ‘Wee One’ is very xeric and will tolerate the heat of summer. 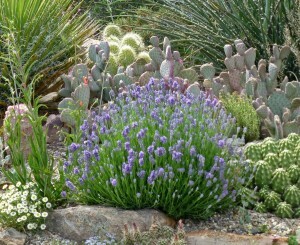 Like other lavender varieties the foliage will be persistent through the year. David Salman of High Country Gardens has brought ‘Wee One’ to Plant Select® and believes it to be a bee pollinated garden cross between ‘Thumbelina Leigh’ and Dwarf White English Lavender (Lavandula angustifolia ‘Nana Alba’). Sometimes size can matter in a garden – and if you are in need of a great little plant for a small space – you can’t go wrong with a little ‘Wee One’.